Going camping is one of the most rewarding and relaxing pastimes for all ages and a camping checklist makes sure you have everything you need on hand. Children love camping for the adventure and excitement, and adults love camping for the freedom, fresh air, and relaxation away from the stress of everyday life. There are camping sites all over the country. Set up close to a steam and enjoy a spot of fishing in the great outdoors, or spend some time in a RV park and enjoy the organized activities and facilities on offer. Which ever one you choose, you are sure to have a great time if you remember your camping checklist. Check out our suggestions below. Camping is a great pastime, even if you can only get away on weekends. To take the guess work out of packing for your camping trip, I have compiled a checklist as listed in the ‘Camping Checklists’ section below. 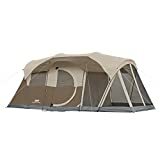 Your needs will depend upon whether you are going camping alone or taking the family, and also if you are going to be camping in summer or the cooler months. It's best to plan ahead. Make sure you have all the camping gear you need before you leave home. It can make the difference between a successful camping trip, and one that leaves you a little disappointed and jaded. So with that in mind, you may need to make a few adjustments to the checklist considering your own circumstances. Happy camping! 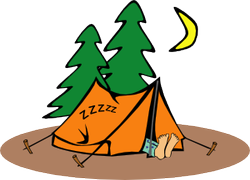 Shelter and bedding are crucial when camping in the great outdoors. They can literally save your life particularly if the weather suddenly turns bad. A pillow, fold up camp bed, a throw rug, and perhaps a book to read. Food, water and clothing are considered another essential piece of your camping checklist kit. You will not be able to sustain yourself in the outdoors if you do not have adequate food and warm clothing for winter or sun protection for the summer months. Be aware that you will probably be more active while camping, which means you will be burning up more energy, and will therefore need more food than you normally would. This part of the checklist is important to get right, or you could find yourself spending some of your time outdoors being very hungry. A good quantity of canned or dried food with an emphasis on nutrition and energy is required as part of your camping checklist. By adding healthy foods to your checklist you will make sure your energy levels stay up and you’ll enjoy your camping trip even more. Jeans, t-shirts, underwear, socks, shorts, sturdy shoes or hiking boots, sun hat, warm sweater, rain poncho, and a swim suit. Even though you are going camping, it is still important to consider a personal hygiene camping checklist. Whilst none of the items below are absolutely essential, you will want to feel good while camping, so they really should be included on your checklist too. Here are some general cleaning items for you to consider also, they will make your life so much easier if you can fit them in. Don't leave home without a Campers' Magnesium Emergency Fire Starter. You never know when you might need to light a fire. Carry it with you at all times, it could save your life! I cannot emphasize enough the importance of carrying a First Aid Kit with you when you go camping. It should never be left off your camping checklist! Of course we don’t want to think about accidents, but it makes good sense to be prepared just in case. If you already have a First Aid Kit, it’s a good idea to check it out thoroughly before you leave to make sure nothing is out of date. You may also want to include a product like Gastro-stop for an upset tummy. These are the things that can make life so much more comfortable and you can imagine why, as you go through this short camping checklist. There are quite a few miscellaneous items that can also make your camping trip so much more enjoyable, and some may say that they should also be classed as essential items. I hope this camping checklist helps you to organize everything you need for your trip. Safe travels and happy camping.